I decided to write a post about superstitions and superstitious people, can we say paranoid people?. As a Spiritualist/Traditionalist I meet these people every day, daunting as it may be I try to manage to deal with their fears, encouraging them that all is the mind!. Superstitious people are evil!. Yes they are. I say this because, if something natural happens to them out of the blue, when the normal circumstances of life occurs, the first thing that comes from their mouths is that it is witchcraft!!. Even the blood pleading Christians who hangs on to the helm of Christ, are quick to be suspicious of each other and everyone. Yes!, they come to me, to my house, for consultations, divination, shrouded in their black cloth, and in the middle of the night, and even in the day time, the Pastors and Bishops, accusing even their families of witchcraft and other things. There are the everyday superstitions like, the right eye jumping, or the left, the right hand itching or the left, a black cat, a ladder, and so on!. It’s all good when these things are dealt with topically, but when it is taken seriously it becomes almost comedic and a lot sad!. In Jamaica everything is Science, Witchcraft, Voodoo, JuJu, if somebody dies the community begins to whisper that it is Obeah. And sometimes the Obeah is retaliated upon some innocent person, because some lame Obeah man expand on your fears for money and facilitate your lies and madness for money. Come on people, be the doubtful Thomas, I am!. As a spiritual woman, that knows that witchcraft exists I do not accuse people of witchcraft unless it is proven, or can be proven by oracle or otherwise, you do the same!.. Here is a very good article I found from, Lifescript.com. Read and enjoy. 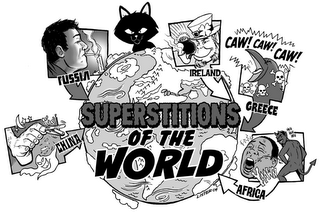 Common superstitions can be described as beliefs that have no rational basis. Some superstitions may be just for fun while others may affect you deeply enough to affect your choices in life. None of them are based in fact, but many have roots deep in tradition and history. Most of us probably don’t even know why we give a little shudder when we see a Friday the 13th looming on the calendar or toss salt over the shoulder when the shaker gets spilled. However, many of our common superstitions come with a colorful history or story that may date back centuries. If you would like to know why you shouldn’t walk under a ladder or whether a black cat is really a creature to avoid, read on for the best list of common superstitions that are still a part of our culture and where they came from. Many of us can’t help but get a shiver of trepidation when we realize that a Friday the 13th is lurking within the current month. A fear of the number 13 is one of the most common superstitions around, and is so widespread that many apartments and hotels omit the 13th floor and some airlines fly without a 13th row. The most popular thought on the origin of this origin is that Judas was the 13th guest at the Last Supper and that Christ was crucified on a Friday. Put it all together, and you have one unlucky day of the year. There seems to be a lot of variations on this superstition, but the idea of having an itchy palm generally refers to someone who is greedy or has an insatiable desire for money. In Shakespeare’s Julius Caesar, Brutus states, “Let me tell you Cassius, you yourself are much condemned to have an itching palm.” Some believe that if the right palm itches, you will meet someone new, while an itchy left palm means that money is coming. It’s common sense to avoid walking under an open ladder for fear of something falling on you, but there are superstitious reasons for doing so as well. Consider the shape of an open ladder; a triangle that signifies life to some. When you walk though the triangle, you are tempting the fates. You may also awaken spirits that live within the triangle (including evil spirits who may not be happy with the disturbance). If you do accidentally walk under a ladder, you can counter the bad luck by placing your thumb between your index and middle finger. Another method is to cross the fingers on both hands to call upon the sign of the cross to protect you from evil. Most will tell you that the agreed upon time span for bad luck is 7 years. 7 years is also how long it takes to fully rejuvenate the entire physical body. Some people believe that this is the luckiest of all symbols, especially if it is found with the open end pointing toward you. If you find one of these gems, pick it up with your right hand, spit on one end, make a wish and toss it over your left shoulder, leaving it where it lands. You can also place a horseshoe over the entrance of your home with the open end down to bring luck to the family living within. Some traditions say that the number of nails left on the horseshoe will indicate how many years of good luck are to come. It seems like a no-brainer that opening an umbrella inside can be bad luck, since it runs the risk of breaking valuable items and poking folks in the eye. However, there are also common superstitions that prohibit this act as well. Umbrellas that shade us from the deified sun are considered magical. When the umbrella is opened inside and out of the way of sun’s rays it offends the sun god. It may even signify impending death or ill fortune for both the person who opened it and the people who live within the home. Salt has always been considered a valuable substance capable of purifying and warding off evil spirits. By tossing spilled salt over your left shoulder, you are driving away the evil spirits lurking with the intent to cause misfortune. This is a tough one for cat lovers to swallow, but in the Middle Ages it was thought that witches kept black cats as companions. You may think it is etiquette pure and simple, but blessing someone after he sneezes is actually a common superstition. In the 6th century, people were congratulated for sneezing because it was thought they were expelling evil spirits. Early Romans believed that a good sneeze could release your soul into the world, and a “bless you” would keep it safe. When the plague hit Europe in 1665, the pope mandated that everyone should be blessed when they sneezed since they were probably going to die. The blessing was usually followed up with the sign of a cross for good measure.Common superstitions still have a place in homes across the globe today, and many of us enjoy finding out the reasons behind the rituals to make sense of them. Whenever you toss the salt, knock on wood or bless someone when they sneeze, you are making the world a safer place from all the evil spirits lurking about. You never know when your simple action to counter bad luck will be just the thing to make your world and the people around you a bit happier.How Superstitious Are You? Do you take great care with mirror glass? Would you never even dream of walking under a ladder? Well, aside from seeming eccentric in your avoidance of some pretty harmless things, you’re also probably very superstitious. Though some people take certain age old beliefs as seriously as they do the law, there are varying degrees of superstition. Take this quizto find out where you fall on the superstitious scale. And if it makes you feel better, you can rub your good luck charm before we begin. Others say that an itchy right palm means money coming in and a left-handed itch foretells money going out. The bottom line is, if either of your palms itch, do not scratch them or you will counter the effect – unless you scratch it on lucky wood or brass. GG mi lub yuh reach mama? Mainy huni how u do?? Obara beg yuh fine 2 chune deh…..Stanley an di Turbines maybe???? Come man mek wi liven up di day tiddeh….sum ah wi far fram yawd, so mek wi celebrate inna wi owna way…..Whey oonu sey ppl?